The AIIT library’s latest refurbishment project is the conversion of one of its basement rooms to provide further storage for collections. 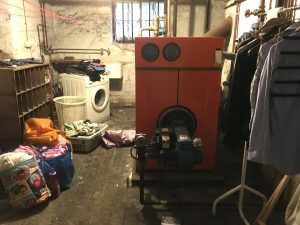 What is currently the boiler/laundry room will be the third basement room to be converted to allow space for new rolling stacks to be fitted. 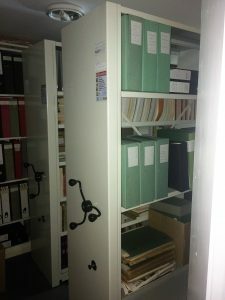 The installation in 2015 of 30 bays for storage in a previously converted basement room provided an additional 180 linear metres of book space. 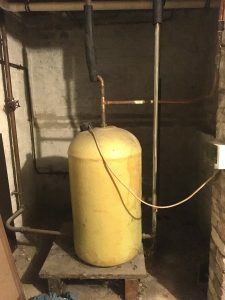 After the conversion of our boiler room (which will include a much needed upgrade to a more efficient system), there is the potential for a further 120 linear metres of invaluable storage space. Building work will begin next week, from Monday 5th June until late August and there may be limited access to certain collections, specifically those in the rear library extension, during this period. We will keep you posted of the project’s progress over the summer and recommend that if readers are planning a visit to use the library collections, they should please contact the librarian in advance to check for access and availability of material.